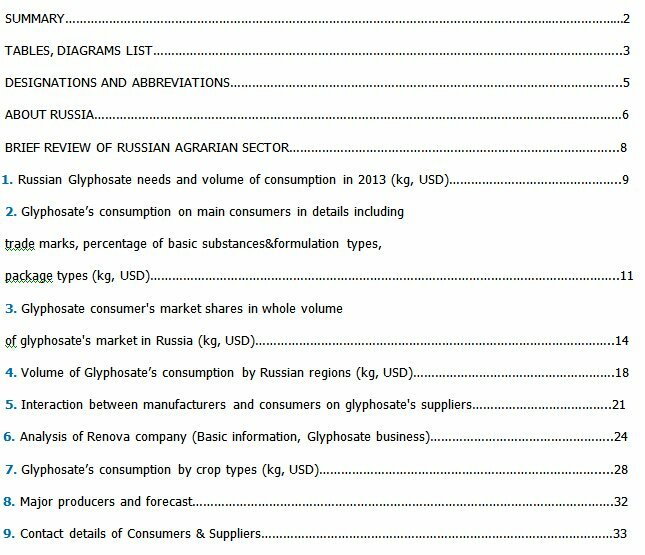 The present Glyphosate Survey provides a whole market picture of Glyphosate’s market in Russia that is a research result with the most possible deep detailed information. In order to give our customer the better understanding of analyzed country, this research provides an overview of the state of Russia (regional location, area, population, religion, natural resources, industry, etc. ), as well as affect the general trends of Russian agrarian sector. Survey presents the forecast of Glyphosate needs in CIS-countries and in Russia particular, presenting the details of Russian glyphosate’s consumption in 2013 expressed in kg and USD. The information is given about whole Glyphosate consumption within complete year 2013, as well as Glyphosate’s consumption on main consumers in details including trade marks, percentage of basic substances&formulation types, package types. 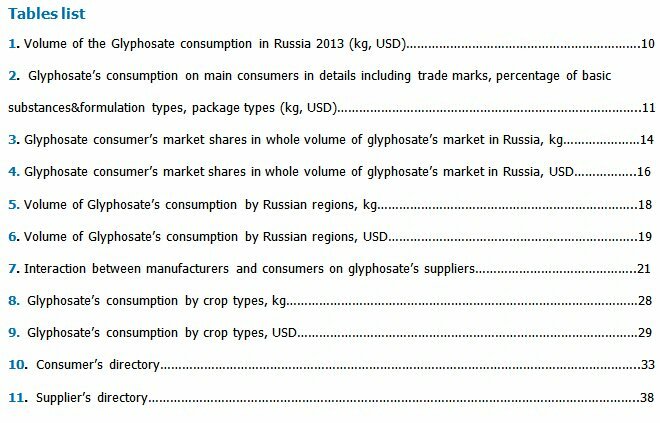 Glyphosate consumer's market shares in whole volume of glyphosate's market in Russia are widely showed at this review. Volume of Glyphosate’s consumption is presented depending on Russian regions. The interaction chains between manufacturers and consumers on glyphosate’s suppliers have been traced. Moreover this research covers the analysis of Renova Company including basic information, its current Glyphosate business, its new plan of Glyphosate. Details about crops are used Glyphosate and consumption by crop types are showed at the present research particularly. Major producers and forecast, Consumer’s directory and Supplier’s directory with appropriate companies contact details like telephones, faxes, e-mails, web-sites have completed the Survey. The data are resulted for the whole year of 2013. The primer target of this Survey is to help the professionals of the strategic groups and management team with taking a proper decisions while entering to the Russian glyphosate’s market and maximize the benefit while negotiate with business partners. It gives a detailed analysis of the Russian glyphosate’s market and speaks comprehensively about 2013 year scenario of the important market tendencies and forecast. This Survey is made on the basis of the statistical information received from the official sources. 2014-07-11 Pages:215 Language: English Publisher: Global Industry Analysts, Inc.